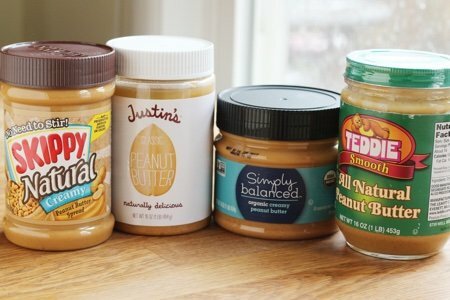 What is the Healthiest Peanut Butter? It should be easy to find the healthiest peanut butter but it isn’t. The world of food marketing makes it so much harder than it should be to determine what the best choice. Peanut butter is one of those foods that is incredibly nutritious and can be an excellent choice for healthy eating. A form of peanut butter is the food that the United Nations uses to feed the malnourished in famine situation because it has fat, carbohydrates, proteins and it is an excellent source of vitamin E and B vitamins. If you like it – you should eat it! I first talked about peanut butter years ago when my husband came back with Jiffy from Walmart. He thought all peanut butter was the same – simply roasted peanuts. PB2 is also a favorite of mine because it adds peanut butter flavor without the calories. I went to Target to see if I could pick out the healthiest and least expensive peanut butter option to feed my family. First up – Skippy – Natural. 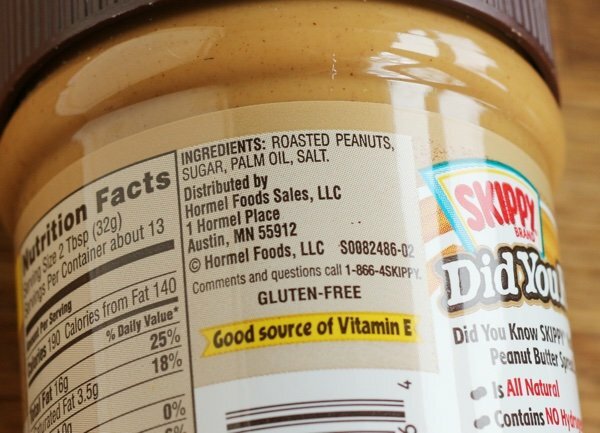 I knew that regular Skippy wouldn’t be the best choice because of the added sugar and palm oil – but, guess what? Natural Skippy has palm oil and sugar, too! I don’t think there is much of a difference between “natural” and regular Skippy. It is too bad because this was the cheapest of all the peanut butters. Then, I checked out a much more expensive brand (twice the price!) – Justin’s. The packaging is so cute! But, alas, Justin’s also added palm oil to its peanut butter (but no sugar). This made me sad because I wanted it to be perfect. Teddie Peanut Butter is a regional brand to Massachusetts. You will find regional brands throughout the USA that ARE what you are looking for. This is an excellent choice with simply peanuts and salt in the ingredients list. It was about 30% more than Skippy’s Natural. 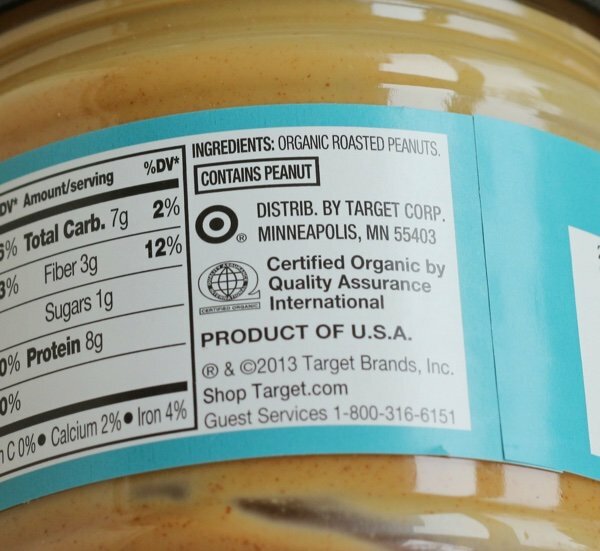 Finally, the Target brand – Simply Balanced Organic Creamy Peanut Butter – was the best because it was simply “organic roasted peanuts”. It cost twice as much as Skippy. I don’t think it is necessary to eat organic peanut butter for it to be healthy. I do think that added sugar and palm oil are not necessary or good for you. Plenty of other great choices are out there. The Trader Joe’s brand is excellent, Smucker’s has an all natural choice (which is only roasted peanuts and salt), and you can’t miss at Whole Foods (where they don’t sell Skippy or Jif). What is your favorite peanut butter? Why do you like it? Wegmans makes a peanut butter that is just peanuts and it is a lot cheaper than healthy name brands. I usually buy Kirkland (Canada) all natural PB from Costco. Excellent taste and good price. I also have purchased a brand in the US called Richards. It was very good too. Both were 100% peanuts only. ITeddie also offers a "no salt" version, so if you don't want added salt, you can get that one (and this is probably true for other regional natural brands). I wonder why the national-brand "ordinary" peanut butters add extra oil? I guess it probably has to do with achieving a certain consistency? Palm oil is used in cooking in lots of parts of the world, but the way oil palms are raised is super bad for the environment. Cottonseed oil I've heard lots of bad things about (mainly revolving around the notion that it's got more pesticides in it because cotton is a non-food crop), but it seems that probably it's as safe as any mass-produced oil. I live in Eastern North Carolina and here we have Bertie County Peanuts. They sell a peanut butter that is just peanuts, nothing else! I have tried many different kinds of natural peanut butter and this is by far the absolute best! It can be ordered online from their website, pnuts.com. I thought it was very important to buy organic peanut butter as I read the peanuts sit for long periods and to prevent mold they are sprayed with pesticides and such. Kroger brand All Natural. Peanuts. Salt. I can get it for $1 on sale. Yes...I said $1!! I've started grinding my own in the bulk food section of my grocery store.They have peanuts and almonds.Delicious! I forgot! I also buy the Costco Organic peanut butter - just roasted peanuts and salt. Love it! Since this allergy stuff was absent all of my life I concluded long before it was popular that organic is the way to go for the food I consume the most and leave the non-organic food to that which I only consume occasionally or rarely. Not just allergies but hordes of health conditions have been suspect in US food production practices. I've read about our food for 50 years. I'm no scientist, I can't refer to scientific papers but my own sense tells me to err on the side of caution like most every other industrialized country has done. So I choose organic peanut butter with only salt and keep it refrigerated. The word ''natural'' has no legal meaning, its a marketing word. I'm surprised you didn't mention Adam's. It's affordable and perfect. 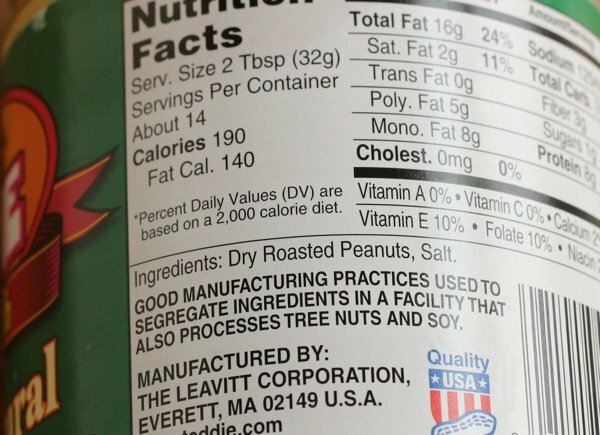 We get the unsalted, so it's just peanuts on the ingredients list. Maybe it's a West coast thing. Jif Brand Because It Does Not Contain Cottonseed Oil. I make mine in WINCO's bulk sections... it's just peanuts I also make almond butter. I actually prefer almond butter for the consistency but get that or peanut butter from Kroger's organic aisle. The Simple Truth brand is great - I get unsalted and add my own salt if I want it so that I have control over the amount. I always buy the store brand at Price Rite but after reading all this I may start just purchasing peanuts and grinding my own at home in the new food processor I won from doing surveys. I saw where people said they grind their peanuts at the store. Is this actually safe? Do we know how often the equipment is cleaned so mold etc. does not get into the batch you are grinding? Just wondering. I have been making my own peanut butter for years because of the sugar and oil added. I just buy a couple jars of unsalted, dry roasted peanuts (I like the dry roasted because they are not as oily) and put them in my food processor and mix to a creamy consistency. So easy and a jar of peanuts you can buy for less than $3. I also have used a Vita Mixer but find it easier in the food processor but both will do the job. I like Better'n peanut butter--I don't think it would pass your test but I like it better than PB 2. I buy Kraft All Natural (crunchy). It seems it is the only supermarket brand that I can find that is only made with peanuts. No salt, no sugar, no palm oil, no preservatives. i started noticing the palm oil addition about a year ago to most pb on the shelf. its what they have replaced trans fats with. its in a lot of stuff, i don't want it. you have to really read the labels. i had bought a bogo pb deal and now im stuck with 2 giant jars. i figure ill make pb cookies and take them to parties where people arent watching what they eat. Nancy, I use cheap PB [skippy] for my chipmunks, squirrels & woodpeckers to add seed to and spread on stale bread, crackers, etc. I leave it on a big rock under my feeder with a rock shelter made by leaning rocks together. Its so cute and entertaining. We use both creamy and crunchy versions of "Crazy Richard's". They are both delicious and the only ingredient is peanuts. The only disadvantage is that you have to stir the peanut oil back into the nuts before spreading... but the taste is wonderful! Sheila, I find that if you refrigerate the type of PB that requires stirring it only has to be stirred once, when you first open it. And I also read that refrigeration slows down aflatoxin, a natural-occurring nasty, from growing. Crazy Richard's all natural from Lucky's Market. 100% peanuts and BPA free. I was buying Crazy Richards - it only contained peanuts and peanut oil - no salt or sugar. Am looking for a new brand. Smucker's Natural Creamy is one of my all time favorite Peanut Butters. Just peanuts & salt! It's so good! Smucker's Natural peanut butter is one of my all time favorite peanut butters....just peanuts and salt! It is So good! Our family really loves Old Home All-Natural refrigerated Peanut Butter (Non-GMO), .95 peanuts & .05 sea salt. Found at Super Target in their refrigerated section. Creamy, Crunchy, Honey Creamy, and Honey Crunchy. Thank you for your great snack ideas! Yeah, this is a good butter, I always make a breakfast for the kids with this butter. Sometimes I even eat it by myself. True confessions...JIF. Although the from time to time I try the all natural and the peanut only brands, but for consistency of flavor and texture ,I keep going back to Jif. Two teaspoons a day will not kill me...as far as I know. The two teaspoons are usually on an apple or on oatmeal toast. Snack girl! Just found your site! 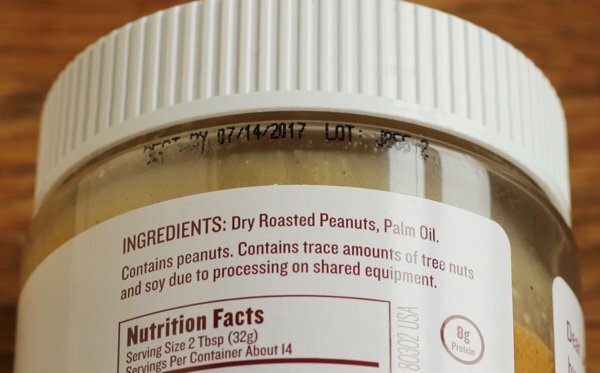 Beware: WHOLE FOODS brand of peanut butter has palm oil! Gross. Just shows you have to read labels! I live in Canada and I like Kraft All Natural crunchy peanut butter which contains 100% peanuts and/or PC Blue Menu Just Peanuts Peanut Butter - Crunchy which like Kraft is 100% peanuts. I will buy either, whichever is cheaper that week. I bought Kreme which has been bought by Crazy Richards. I don' need added salt so 100% peanuts is great. However, not finding it locally has had me try Whole Foods and Trader Joes, which are extremely inferior. I want a rich roasted flavor and lots and lots of peanuts in my crunchy peanut butter, neither of which WF or TJ have. One can't get away from the sugar as all nuts contain sugar. But added sugar? Sugar is a killer. Wake up people! As to cottonseed in oil. It’s not pesticides because the boleweavel is basically extinct, but defoliation herbicides aka agent orange that gets you!